Targeting the workstation and graphics market, the new WX 8200 will hit the market at under $1,000 USD but promises top-level performance. The new WX 8200 will give professionals in the graphics, engineering and entertainment the power they need for a wide range of workloads. Based on the Vega architecture, the new 14nm GPU delivers the performance needed at a professional level. 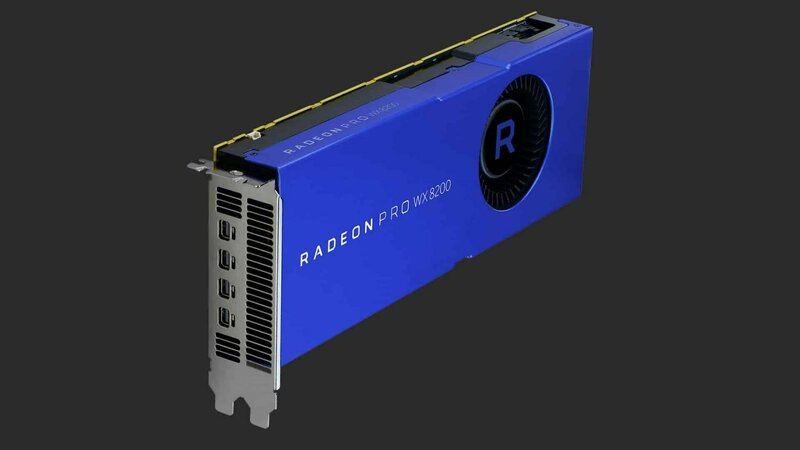 Working with the latest software in mind such as Adobe CC, Dassault Systemes SOLIDWORKS, Autodesk 3ds Max, the Radeon™ Pro WX 8200 GPU is ideal for real-time visualization, rendering and VR workloads. The AMD Radeon Pro WX 8200 boasts impressive specs with 8GB of RAM, up to 512GB/s memory bandwidth, 56 compute cores, up to 11Tflops of processing power, 4 display outputs, and 8K display support have it is poised to be the ideal card for anyone looking to build games, work in media, or meet the demands of the modern creative landscape. In tests, AMD has shown the WX 8200 rivals the performance of what is on offer from Nvidia in the Quadro P5000 and P4000 in media and entertainment based workloads. The AMD Radeon Pro WX 8200 graphics card will be available for Pre-order at Newegg on Augest 13, with on-shelf availability expected in early September at a price point of $999USD.